1. 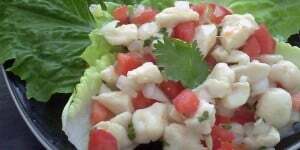 Combine the scallops in a bowl with the lime juice, mix together, cover and refrigerate for about 6 hours. 2. Drain the liquid from the scallops. 3.Add the tomatoes, red onion, chopped cilantro, oregano, olive oil and vinegar to the scallop mixture. Season with salt and pepper. Mix well. The dish can be made up to this point up to 6 hours before serving. Garnish with the lime wedges and cilantro sprigs just before serving.